We'll also have face painting and balloon twists with Atomic Bounce,Caricatures by Mel Conrad, and crafts with Macaroni Kid York, PA starting at 11 a.m. at Continental Square. Some of our media partners will also be hand with giveaways. Head downtown early for a great parking space and save your seat along the parade route. Collusion Tap Works, located at 105 South Howard Street in downtown York's Royal Square neighborhood, will donate a percentage of all sales of its Shenanigans Irish Stout to the parade fund. This special brew will be unveiled on March 8, 2018. Shirts are $13 if ordered by February 10 (shirts not ordered in advance will be $15). To guarantee that a shirt is reserved for you in your desired size, please send a check payable to the York Saint Patrick’s Day Parade by February 10, 2018, with the order form (see link below). Requests for sizes after that date will be available only on a first-come, first-served basis. A limited supply of most sizes will be available for purchase in March, but quantities cannot be guaranteed unless reserved before we place the order with our supplier. T-shirts will be available for pickup prior to the parade for those wishing to have their shirts in advance. The York Saint Patrick’s Day Parade Committee is pleased to announce that David Kennedy will be the Grand Marshal of the 35th Annual York Saint Patrick’s Day Parade, to be held on Saturday, March 17, 2018, along Market Street in downtown York. David is a Co-Founder and Managing Director of Aspire Ventures, LLC, a technology-focused venture capital firm. The company was founded in 2013 by a group of successful entrepreneurs, operators, investors and philanthropists to create a new kind of business enterprise, combining the key elements of a dedicated tech company with those of an early stage venture capital firm. The company has acquired and invested in three principal technologies: mobile, machine learning, and cloud computing. Its business model is to create companies, rather than products, and to invest technology, funding and a variety of other resources in order to accomplish transformative change and a positive societal impact, with a primary focus in the healthcare space. Most recently, David was CEO of appMobi, Inc., whose development tools and cloud services platform enabled any web developer to create and deploy customized applications for smartphones, tablets, and other mobile devices. David had been an active “angel” investor in appMobi since 2007, and in February of 2013, the company sold its developer tools division to Intel Corp., and established a strategic partnership through which Intel offers appMobi’s entire complement of engagement and monetization cloud services to all Intel tool developers. Prior to his work with appMobi, he was CEO/Vice Chairman of Interep National Radio Sales in New York, and also served as CEO of Susquehanna Media Co., one of the largest and most well respected major market radio, cable and internet companies in the U.S., with whom he held positions for 33 years. During the 1970s, David held various on-air and management positions at the company’s radio stations until being promoted in 1983 to Vice President Planning and Research for Susquehanna Radio Corp. In August of 1989, he was named Senior Vice President and assumed direct responsibility for several midwest stations while managing group planning and research operations for all Susquehanna stations. David has chaired, actively participated in, and received numerous accolades from the boards of directors of the National Association of Broadcasters, Radio Advertising Bureau, Broadcasters Foundation of America, and the Library of American Broadcasting Foundation among many others. David is a graduate of the University of Toledo (OH) and he holds master’s and doctoral degrees from Bowling Green State University (OH). He and his wife, Beverly, have three children and nine grandchildren. York County Community Foundation, Inc.
Ireland is a part of me through my father's side of the family. Both of his parents were born and raised in Ireland, his father from Pettigo in County Donegal and his mother from Enniskillen in County Fermanagh. My grandfather came to the US in May of 1921 aboard the SS Aquitania when he was 23, and my grandmother joined him in October of 1925, having traveled on the SS Caledonia. They set up house in Plainfield, NJ, just outside NYC, where my father was born. Within a few years, they left the New York area and moved to Toledo, OH to follow my grandfather's work. My grandfather was one of 6 children, and my grandmother one of 11. None of my grandfather's siblings joined him in the US, but 3 of my grandmother's sisters settled in Toronto, Ontario, so they became a part of our lives, as well. I still have relatives in both Ireland (with whom I've never spoken, unfortunately), and Toronto (with whom I do speak). Neither of my grandparents ever had the opportunity to return to Ireland. 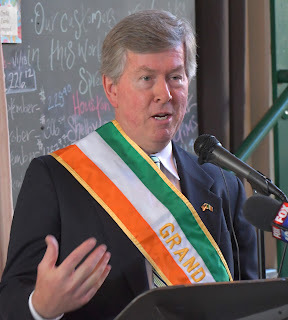 Perhaps for that reason, all things Ireland were omnipresent in their home in Toledo, where I was born, and the customs, hospitality and humor of the homeland became a part of my education from my earliest days, and represent some of my fondest memories as a child.